Designed for demanding users who truly care about preserving the look of their precious MacBook, TrackGuard is a wear-resistant thin film solution that can effectively protect the MacBook's trackpad against the damaging effects of grease, scratches, and smudges. Carefully color-matched, and machined precisely to cover MacBook's trackpad, TrackGuard will protect the trackpad while maintaining the tactile response expected from a mouse. TrackGuard has been surface-treated, allowing fingers to slide easily across it without a loss of sensitivity. It has also been optimized to handle all Mac OS X gestures such as: two finger vertical and horizontal scrolling, two finger right-clicking, three and four finger feature recognition, pinch to zoom in / out, and image rotation. TrackGuard can be installed in seconds, and if removed, will not leave a sticky residue on the MacBook. 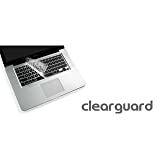 TrackGuard is designed for Aluminum Unibody 13-inch, 15-inch, and 17-inch MacBook Pro. Designed for demanding users who really care about preserving the look of their precious MacBook , PalmGuard is a wear-resistant thin film solution that can effectively protect the MacBook's palm rest area against the deleterious effects of grease, scratches, smudges, and color-fade that accrete over time.